One classic way to make your living space more elegant is by hanging up some photos on the wall. It may be family photos or some paintings by a local artist. In any case, what you want is to put the frames in the correct manner. You want the frames to be leveled correctly and evenly. Now the task at hand may be trickier than you’d imagine. And when you are renovating your entire living place, and have dozens of photos to put up around the house, it can quickly escalate to a cumbersome job. What makes this job a little more convenient are laser levels. These devices make level checking an extremely straightforward job. You won’t ever need to walk back after putting up a frame, tilt your head and judge if it’s put the right way. Laser levels will make sure that the job is done perfectly every time. But laser levels come in several varieties and it can be a difficult job to get the right one. Don’t sweat it though because we’ve come up with some of the best laser levels in the market for you! Bosch is a popular name in the households for delivering good quality tools and equipment. 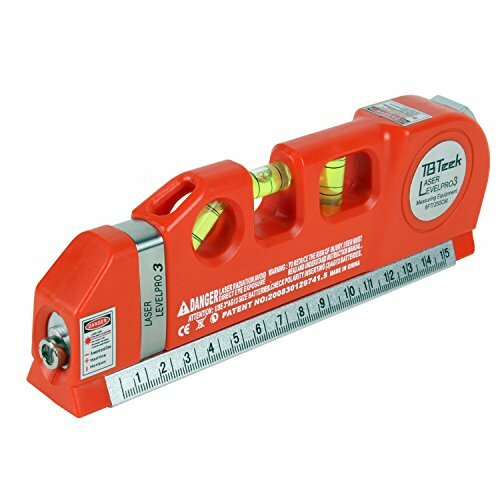 This laser level comes with a single laser line and has an accuracy of 3/16 inches for 30 feet or less. Moreover, it comes with a 16-foot line range and 65-foot point range. What we found was great about this leveling tool is its simplicity. 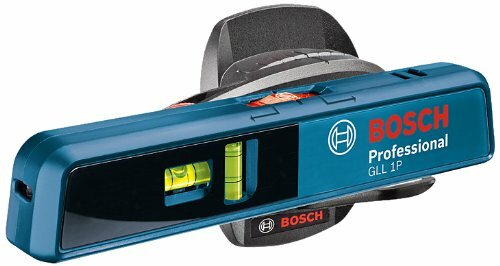 Bosch GLL 1P laser level comes with versatile mounting accessories which make its setup a really straightforward task. Its mounting thread makes it possible to mount it on most universal tripods and it also has a magnetic mounting base. We recommend using it indoors. It’s perfect for working at a short distance. And you won’t need to detach the tool from the tripod at all while using it. The projected light is bright and sharp. We had no problem in working with the tool and the result was perfect each time. Changing batteries and handling the tool is extremely convenient as well. It has a handy design and the tool is of a great quality like any other Bosch product. It also works as a spirit level as it comes with two vial bubbles. So this tool finds its uses even when your project is not about hanging photo frames on the wall. Hammerhead HLC101 is a great value proposition for those who are only using it for light household use. It has a compact design to easily chuck it away in a cupboard when not in use. It’s cheap and it’s meant for various domestic applications. In our experience, we found that this product is good for very light use only. But, since the HLC101 is inexpensive, it’s unreasonable to put too many expectations on this product. Having said that, it’s great for household jobs like tile layout, wallpapering, paneling or hanging pictures. 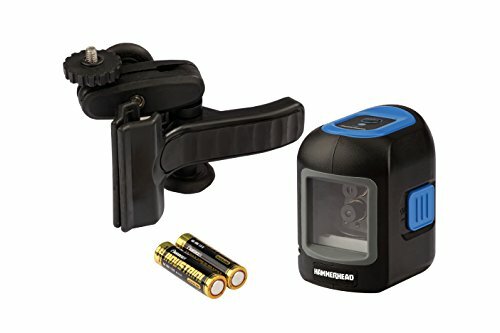 The device is extremely handy and compact, and while it doesn’t come with a tripod, it does come with a clamp that makes it easy to use. It’s also powered by two AA batteries and has a cross-section of laser lights. It’s reasonably accurate as well – ¼ inches at 30 feet. And even though this product can’t stand against tools from Bosch or DeWalt in terms of quality and functionality, we think it’s perfectly fine for domestic use. It’s cheap, light and compact. And it also comes with a 3-years limited warranty. There’s not much to complain about, especially when you consider its price. TBTeek offers a lot of versatility in one device. A multipurpose device like this can be of great use from time to time. 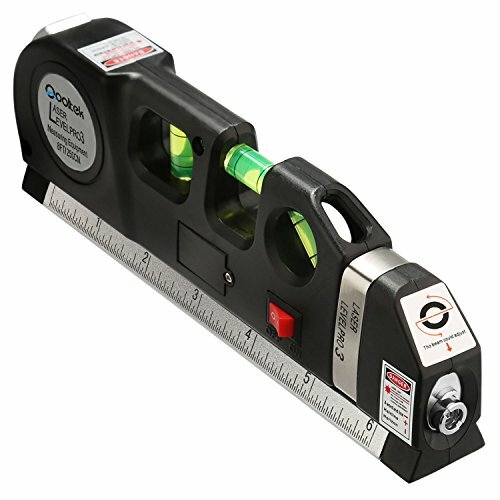 Apart from the laser leveling system, this tool also has triple-positioned bubbles for leveling and a measuring tape that is pretty accurate. In our usage of the product, we found that it was extremely handy when we wanted to hang up a picture, because all we needed for the job was this tool and a pencil. The included measuring tape is handy and useful. It’s well built and is 8-feet long, which is perfect for small domestic DIY-projects. It snaps on the item we are measuring easily and is sturdy by design. Even the included smaller scale on the side was helpful when we wanted to measure nails and screws and rolling out the measuring tape was too much of a hassle. And the spirit levels also function as expected. The light is not that great though. It’s only meant for usage in dimly lit indoor situations and it didn’t work at all in bright environments, like in direct sunlight. Otherwise, we had no complaint with it as the laser projection is very accurate. Sturdy build quality and feels really snappy and functional when in use. This device comes with a magnetic base, a nylon carry pouch, and AA batteries to get on with the work right away. It also comes with a 2-year warranty. But we don’t think you’ll ever need to redeem the warranty because the tool is sturdy by design and the pouch keeps it safe from any damage from outside. While we got time with this device, we found out that this device can be explained in just one word; functional. And we are not saying this in a condescending tone. In our experience, it’s perfect! 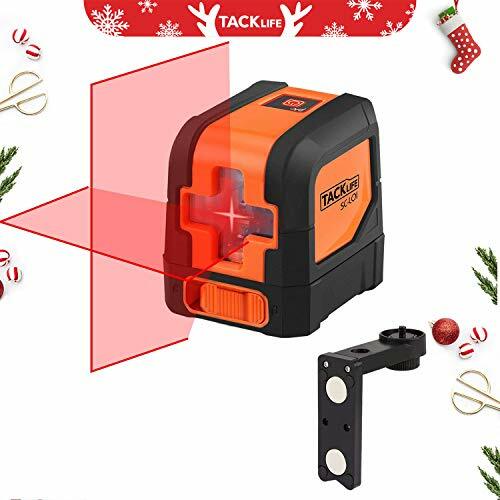 The device is designed entirely for just one purpose, i.e., to be a good laser level. It’s compact in design and produces cross-sectional laser projections. The device auto levels on a horizontal or a vertical surface by using a pendulum. But if you want to use it manual mode, just press the button on top. We found that the small features in this tool make it really convenient to use. For example, if you leave the device unattended for 30-minutes or so, the tool will automatically shut down to save on power. Also, the tool is incredibly accurate and works fantastically in well-lit environments as well. It can do any kind of job thrown at it when it comes to leveling. Installing kitchen furniture, hanging up frames, working on prints, wallpapers, etc. Even the design is compact and sturdy. All in all, our verdict is that this product is exceptionally built for what it’s meant to do and nothing extra. Qooltek’s offering is another multipurpose device on this list. This one also comes with triple-positioned leveling bubbles, a fine-tuned measuring tape and a sideways ruler for small and quick measurements. It’s straightforward to use as it comes with only one on and off button. It’s designed to be compact, durable and easy-to-use. The levels work excellent and you can do use it for any DIY-project in your home. It’s even competent enough to be used by carpenters and professionals for regular business and industry use. Although, we must say that the laser, like many of our entries, is dim and only suitable for indoor use. In our experience, we found that the device works just fine in all the multiple services it provides. The measuring tape also works well. But you may need an extra hand if the measured surface isn’t plain. Usually, you just need to press two buttons to use a laser level. First, level your laser level correctly. Some laser levels have an auto-leveling system and you can set those up pretty easily. While others require you to check the included spirit level. Once it’s leveled, all you need to do is project the light on the surface you want to work on. 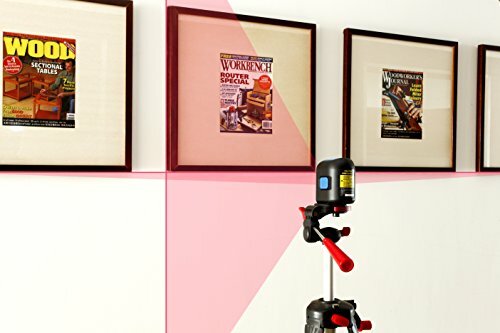 Use this laser light to align whatever you need to align like picture frames or wallpapers. Voila! The job is done. Laser levels are highly specialized devices which should be used with utmost care. Like most hardware tools, laser levels can hurt the user as well if not handled responsibly. Lasers are harmful to eyes and sometimes, even skin. 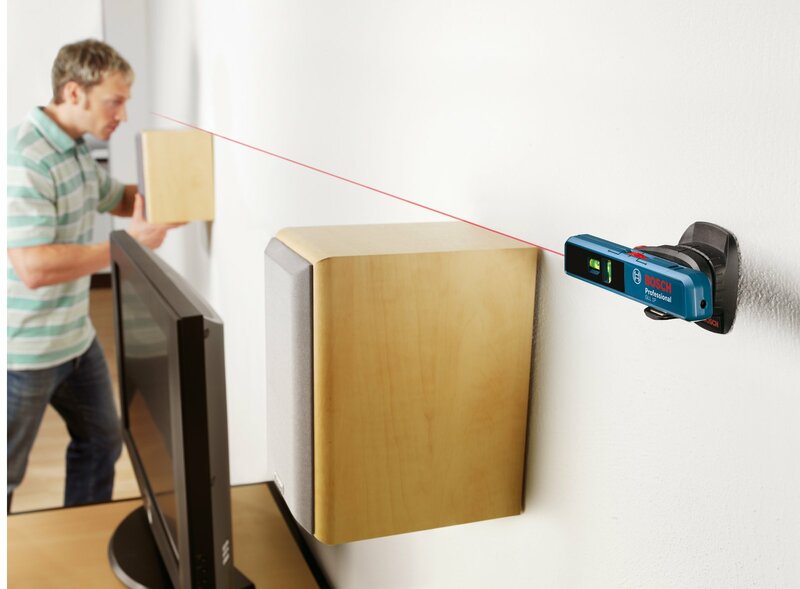 Here are some safety tips to keep in mind while using a laser level. Eyes are extremely vulnerable to laser beams and can get heavily damaged under direct exposure. So it’s advisable to wear safety glasses that are meant for protection from laser beams. Be sure to keep laser levels from the reach of small children. Playing around with a tool like this can cause serious injuries to their eyes. Make sure that you don’t leave the laser level active and unattended. If it focuses for too long on any inflammable object, it can induce fire quickly. So here it is. All you need to know about laser levels is laid right here. From all the best laser levels you can get for your money to all that is needed to know to correctly and safely use it. We hope this guide was of aid to you and with that, have a great time getting some crafty work done.